Seriously, haven’t we all wondered about this? After reading this article, I don’t know about you, but I’m thinking “Alan Shepard Pie” should be coming right up. A version of this New York Times article appeared in print on October 14, 2008, on page D2 of the New York edition. Q. 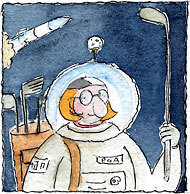 What happened to the golf ball the astronaut hit on the Moon? Why did he hit it? A. Alan Shepard actually hit two balls on the Apollo 14 mission of 1971, and they are still on the Moon, he said in a 1991 interview on the Academy of Achievement Web site for students. He was looking for a way to demonstrate what the Moon’s lack of atmosphere and much smaller gravitational force would mean for a familiar Earthbound activity, he said. Previous astronauts had dropped a small lead ball and a feather, which slowly fell at the same rate to the surface, but he wanted something more striking.